The season of Lent officially began with Ash Wednesday. But I don't attend a liturgical church, and we don't have an Ash Wednesday service. My faith upbringing was non-liturgical–even anti-liturgical, if there is such a thing–so my thoughts don't naturally turn to Lent. As I've gotten older, I've grown to appreciate the various observances of the "church calendar," although I still wince a little bit at that term. To put it very simply, this calendar arranges itself around events in the life of Jesus. So the year begins with Advent, the season leading to the birth of Christ. Then comes Christmas on December 25, then Epiphany, which is a celebration of the manifestation of Jesus as the son of God. We have no record of the actual dates for any of these celebrations. The Bible doesn't tell us the date that Jesus was born to Mary. The earliest records we have that the birth of Jesus was celebrated on December 25 was the year 336, when Constantine was emperor. But the birth of Jesus is certainly an event worth celebrating, isn't it? After Advent, Christmas, and Epiphany comes the beginning of "Ordinary Time." Until fairly recently, I had no idea what that term meant. Contemporary English speakers usually think of "ordinary" as meaning routine or nothing special. Our word ordinary is derived from the Latin word ordinarius, which means customary or usual. The root of ordinarius is ordo, which means series or arrangement. It's easy to understand that our English word order comes from this root, and it might be helpful to think of "Ordinary Time" as "Orderly Time," which is another way of saying "counted time." These are days when there's no particular holiday, so in that sense I guess they're "ordinary" in as we usually understand that word. But these are most of the days of our lives, so we do well to mark them, to understand that they're important. Ordinary Time is interrupted by the most important season of all: that of the death of Christ on the cross and his resurrection from the grave. This is the one time we can mark with some certainty, although it doesn't occur on the same date every year. The Bible tells us that Jesus and his followers went to Jerusalem at the time of the Passover, the Jewish celebration commemorating the exodus from Egypt. This was the time when the enemies of Jesus demanded his crucifixion. Passover is still celebrated by Jews, so the dates of everything on the Christian calendar related to the crucifixion and resurrection of Jesus derive from the date of Passover. And that brings us to Lent. Lent is the season of the 40 days (not including Sundays) that lead up to Easter. The Lenten season begins with Ash Wednesday, a day on which some Christians may participate in a service that involves having ashes placed upon their foreheads in the form of a cross. That imposition of ashes upon one's head is symbolic, of course, but what a powerful symbol! With the placing of ashes on one's head may come the entreaty: "Remember that you are dust, and to dust you will return," echoing God's words to Adam in Genesis 3:19, or "Repent and believe in the Gospel." The word "gospel" is important. Its literal meaning is "good news": the word gospel is derived from Old English god (good) + spel (story or news). The very best news of all time is that God loves us, so much that Jesus came to earth to give his life for us. 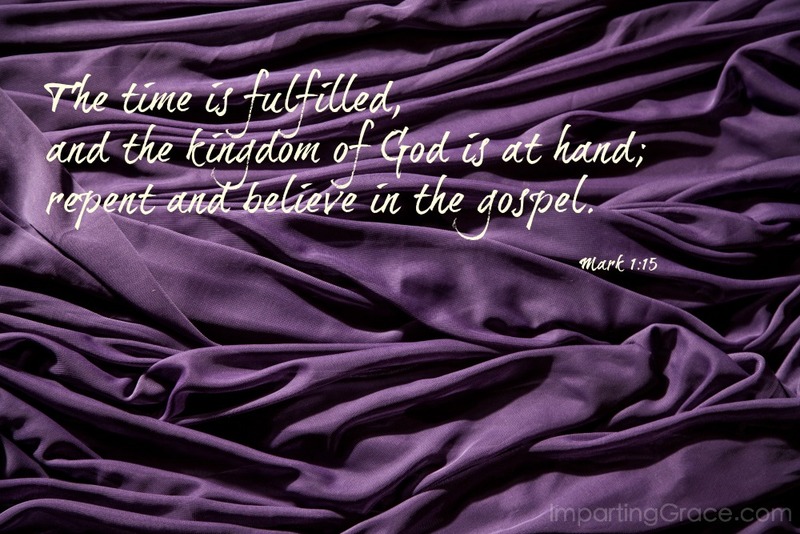 The Gospel accounts in the Bible (the books of Matthew, Mark, Luke, and John) tell us that Jesus went everywhere announcing the Kingdom of God. "Repent for the kingdom of heaven is at hand," Jesus said (see Matthew 4:17, Mark 1:15). I love the way my friend Dallas Willard summed up the message of Jesus: "Re-think how you're living your life in light of the opportunity to live in God's Kingdom today and forever." How do we avail ourselves of the opportunity to live in God's Kingdom? By putting our confidence in Jesus. We trust that our sins are forgiven because of his death of the cross. We trust that what he taught was true. We trust that the way of living he explained and exemplified is the best way to live. And we remember that we are dust. Just a short time of trying to live like Jesus will demonstrate to us that this task is beyond our human abilities. So we trust the strength to become more like Jesus will be supplied not by our own power but by the grace of God. We welcome the days leading up to Good Friday and Easter as days to ground ourselves once again in the truth that we are in need of what only God can provide. 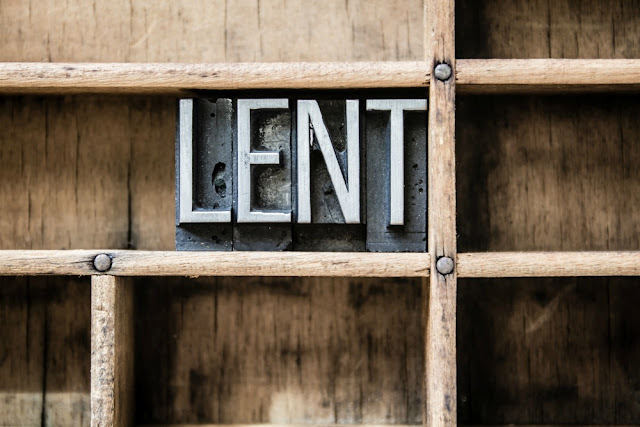 As a symbol of penitence or an aid to thinking of our need for a savior, some Christians mark the season of Lent by some form of fasting or self-denial. You might hear of what a Christian has "given up" for Lent. Give up grumbling. Instead, in everything give thanks. Give up 10-15 minutes in bed. Instead, use that time in prayer. Give up looking at people's worst points. Instead, concentrate on their best ones. Give up judging by appearance and by the standards of the world. Instead, learn to give up yourselves to God. Aren't those wonderful? Yet even these simple things I can only accomplish with help from God. So I am once again brought to my knees in gratitude for the good news. I don't just believe the gospel; I am thrown upon it. And in these weeks leading up to Good Friday and Easter, that's a good place to be. I'm joining Jennifer Dukes Lee for Tell His Story. Thank you for these words today. I love the Liturgical year and it is how I grew up. There is so much to learn from it. Blessed to be your neighbor today at Tell His Story. How interesting, Richella. This is a great post. I finished reading a few weeks ago about the church calendar and that we don't really know the date that Jesus was born. The date was picked, I believe, according to the STAR that appeared and that gave them a general time--and we do know it was cold. So many of our 'rules' are man-made, or man-decided, but they do all center around the life of Jesus. I guess it is just like if you adopted a child and didn't know the date they were born. You would 'guess' as close as you could and assign that date as the child's birth date. Grateful for a visit to your place of grace. Dawn Boyer, thank you so much for your lovely comment! I first thought to include the term "ordinal number" in this post, but then I thought that most people wouldn't be familiar with the term. What a delight to know that you're not only familiar with the term, but you teach Latin! I've only studied Latin a little bit, but the history of language fascinates me. And of course our use of language fascinates me as well, so I bless you as you make progress in not speaking idle words. What a wonderful informative post! Being a Lutheran, I am very familiar with the liturgical calendar and like the way we have certain times of the year to celebrate and honour the very significant events in Christ's life. And indeed, I look to Lent as a time of self-reflection and prayer leading up to the joyous celebration at Easter.